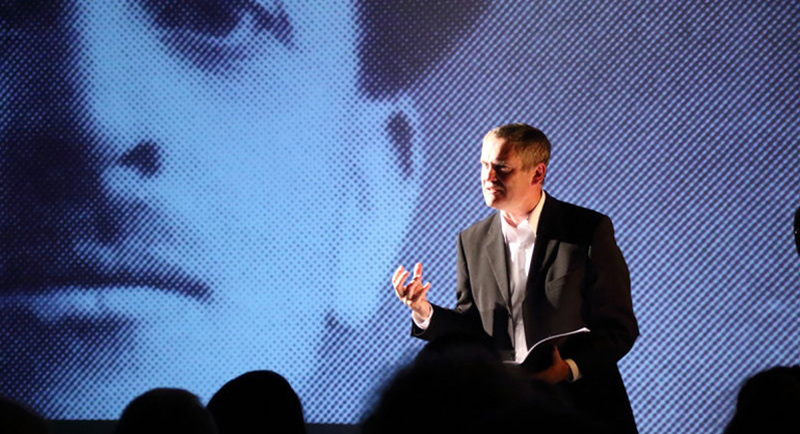 A multimedia poetry show, revisiting the life of Hedd Wyn and exploring the nature of loss and identity. Following a hugely successful first tour in 2017, Y Gadair Wag | The Empty Chair returns to theatres and venues across Wales this February and March. 2017 marked 100 years since the Third Battle of Ypres (Passchendaele) where thousands of soldiers were killed, with approximately 3,000 casualties among the 38th Division (Welsh). One of those who fell in battle was Hedd Wyn, the poet from Meirionnydd who died before being announced winner of the Chair at the National Eisteddfod in Birkenhead later that year. The empty chair was draped in black, and Hedd Wyn is still remembered in Flanders, as he is in Wales, as a potent symbol of bloodshed and loss. Created by Ifor ap Glyn, National Poet of Wales, directed by Ian Rowlands and with digital art by Jason Lye-Phillips, Y Gadair Wag | The Empty Chair explores themes of loss and identity; using film and experimental techniques to look at Hedd Wyn’s life and works alongside other poets of the First World War. The tour is funded by Yr Ysgwrn and the Welsh Government’s Cymru’n Cofio Wales Remembers 1914-1918 First World War Centenary Programme and is in partnership with Canolfan S4C Yr Egin. NOTE: Performances are in Welsh, unless stated otherwise. Book now for this strictly limited run.